San Diego County’s housing market ended 2014 with a bit of momentum, as the median price of a home sold and the number of transactions both increased in December. It was the first time since September 2013 that sales and price both saw annual gains in the same month. In December, the median price for a home sold in the county was $440,000, up 4.8 percent from December 2013, real-estate tracker CoreLogic DataQuick reported Wednesday. Also, 3,290 properties changed hands in the final month of 2014, up 191 over December 2013. Transactions in December, however, rose 23 percent over the 2,675 sales in November. That was the largest monthly gain since activity rose 35 percent from February to March 2013, when 3,762 properties changed hands. CoreLogic DataQuick Analyst Andrew LePage said activity generally increases between November and December, as investors and other businesses try to close deals before the year’s end for tax purposes. He also noted that December had five more business days than November 2014. Mark Goldman, a loan officer and real-estate lecturer at San Diego State University, said the pick up at the end of the year could have been due to a markedly slow summer peak buying season, and therefore there was some pent up demand. He said while interest rates remain low, people only would rush to buy a property if rates were on the way up. In December, the average rate for a 30-year-fixed mortgage fell to 3.86 percent, the lowest since May 2013, Freddie Mac reports. Overall, 2014 was a year that saw the market cool after a large run up in 2013. In 2013, investors pushed annual appreciation to as much as 24.1 percent by the summer, as they fixed-and-flipped foreclosure resales for big gains. When the supply of foreclosures waned, the market began to rely on traditional factors such as affordability, employment, and wages. 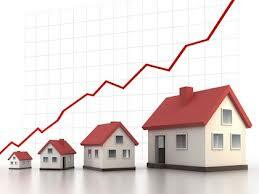 Home value gains slowed, and the median price hovered between $430,000 and $450,000 over the final six months of 2014. Inventory remained well below the norm in December, with 6,773 active listings in the county, the San Diego Association of Realtors reports. While that amount is up about 550 from December 2013, it represents only about two months of supply at December’s 3,290 transactions. Real-estate analysts would prefer to see six months of inventory to consider the market healthy. While price appreciation slowed in 2014, the median price for home still reached a seven-year high at $450,000 in June. At that time, which was peak buying season, annual appreciation was at 8 percent, down from the 24.1 percent seen from June 2012 to June 2013. In December, the median price for a home in Los Angeles County was up 7 percent to $460,000, while Orange county’s median rose 3.7 percent to $591,000.